How we choose to live our lives, fulfil our needs, and realise our hopes and dreams are all things that define us and the role we play in the world. Modifying these behaviours and choices is critical in the mitigation of climate change and resource scarcities. We have reached a point where it is imperative that we move beyond small, isolated measures of change. With an ageing European population and new climatic challenges on the horizon, we must inspire people to willingly transition to a broader spectrum of lifestyle changes. Success lies in engaging consumers through their values and belief systems across their professional and private lives. 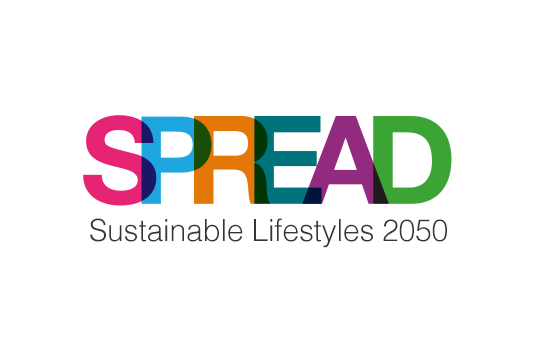 By mobilising existing knowledge, experience, and best practices, the SPREAD Sustainable Lifestyles 2050 project aimed to develop a vision for future sustainable lifestyle models. To achieve this, the project first aims to better understand the underlying dynamics of lifestyle changes that could trigger the dissemination of best practices and enable sustainable lifestyles to become truly mainstream ways of living. The project’ s scope will include the following themes: sustainable living, consuming, and moving as well as health, welfare, equity, and ageing. Creating alternative future scenarios of sustainable lifestyles for 2050, including social and behavioural innovation, will help identify necessary changes in society. Interactive scenario-building and the visualisation of concepts, visions, ideas, and actions for new models of sustainable living are techniques used within the project. By backcasting from the future 2050 vision of sustainable living, the project developed a roadmap of action strategies for individuals, businesses, civil society, the research community, and policy makers. An interactive multi-stakeholder dialogue brought together representatives of civil society organisations, business, research and policy to collaboratively work towards developing a better understanding of how to enable more sustainable lifestyles. An analysis of promising sustainability practices took into consideration the surrounding context and the various perceptions and viewpoints of stakeholders through interactive live platform meetings and online discussions. Through a People’s Forum everyday citizens also took part in the visioning process. This process guaranteed a strong contact to the realities of everyday people. Working groups analysed the areas of sustainable consumption, living, mobility and society. The working groups participated in the common discussion on different visions of the future. This interactive process provided alternative future scenarios for sustainable lifestyles which will in turn point to social and behavioural innovation and related opportunities for business innovation. The SPREAD Sustainable Lifestyles 2050 project was implemented by an experienced consortium coordinated by the CSCP. The consortium includes: Ashoka France; Demos Helsinki, Finland; Ecoinstitut Barcelona (ECOI), Spain; Energy Research Centre of the Netherlands (ECN), The Netherlands; EuroHealthNet; Lund University (ULUND), Sweden; The Northern Alliance for Sustainability (ANPED); Politecnico di Milano (Polimi), Italy; Regional Environmental Center for CEE Countries (REC), Hungary. The project was kindly funded by the 7th Research Framework Programme of the European Commission (EU FP7). Selected representatives from government, education and civil society organisations, as well as private sector organisations (Autostadt, Ferrero, Henkel, IKEA, Kraft Foods Europe GmbH, NOKIA, Turkish Business Council for Sustainable Development, Unilever) fulfilled the role of external advisors throughout the project. All advisors can be found here.